For many years we’ve been told to reduce the intake of saturated animal fat in our diet. This advice originated from studies in the 1950’s linking heart diseases to high saturated fat consumption. What happened next was that hydrogenated vegetable oils were introduced and promoted as animal fat substitutes by the vegetable oil processing industry. The conventional wisdom was that vegetable oils, which are full of unsaturated fat, are better for us. Unfortunately the hydrogenating process introduces trans-fat into the product, and they have been implicated in the increase of heart disease incidents during the last half-century. Now many researchers are having second thoughts because new studies indicate that natural animal fats can be beneficial to our health. There is now a movement to re-introduce natural saturated fats back into our regular diet. The emphasis is on natural because many commercial products made from saturated fats have been hydrogenated to make them shelf stable, hence making them unhealthy. Ideas about many saturated vegetable oils have also changed. Coconut oil and palm oil have been proven to be quite beneficial for our health. Thus with open mind I am resolved to start incorporating these natural saturated fats back into my cooking. What better way to celebrate the return of lard than making taro paste (芋泥). 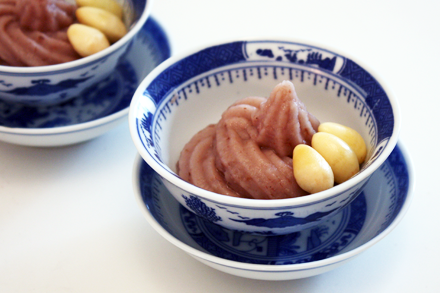 This is a Chaozhou (潮州) dish that is made from taro and lard. I remember restaurants in Asia serving this sweet dish with a thick layer of melted lard swimming on top. We all used to squirm at the notion of eating it but I’m glad I can now enjoy this dish without guilt. Key to successfully making this dish is the use of fresh natural lard. It is now possible to purchase natural lard from a few retail markets as well as directly from the farms. One of my favorite farms is Flying Pig Farm, which sells their products online and at the Union Square Farmer’s Market in New York. From them you can buy leaf lard, which is considered by many to be the best pork fat for rendering, either raw or already pre-rendered. 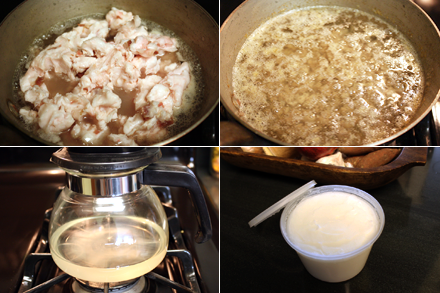 Rendering lard is a very straightforward process. First grind or chop the fat, then cook under very low heat until the fat is completely rendered. When all the fat is rendered strain it through very fine sieve or coffee filter. You can also add a little water during the rendering process to prevent the fat from burning. But in Chinese cooking the lard is often rendered at high heat creating a smoky nutty taste. I believe consuming a good balance of natural non-processed foods is important to a healthful diet. Eating moderate amount of saturated fats should be part of that balance. So, this New Year I urge you to go ahead and enjoy the lard you’ve feared for many years. Happy New Year! Peel and cut the taro into slices of about 1/4 inch thick. Arrange the slices on a shallow bowl. Steam the taro over boiling water for about 30 minutes. While the taro is steaming combine the water and sugar in a small saucepan. Over low heat dissolve the sugar completely. Remove from heat and set aside. Combine gingkoes, sugar and water in another small saucepan and simmer over medium heat. Cook until the liquid is reduced to about half the amount or about 10 minutes. Set aside. When the taro is completely cooked, melt the lard thoroughly in a small saucepan. 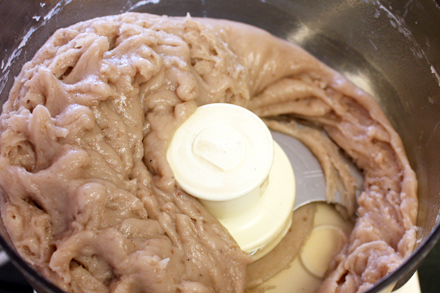 Then combine the taro, lard and the simple sugar syrup in a food processor. Blend the mixture until it becomes a smooth thick paste. 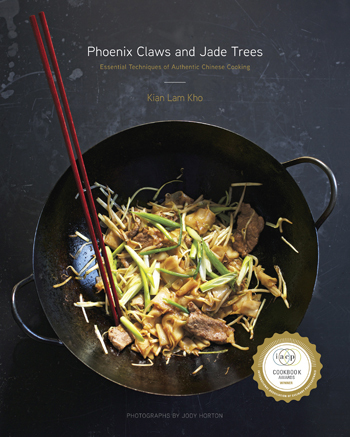 Serve hot in small bowls garnished with the sweetened gingkoes. You’ve rendered (!) the nutritional message to its essence: moderation is the key that allows us to enjoy the greatest variety of natural foods. And besides, isn’t so much of the wonderful flavor in the natural saturated fats? 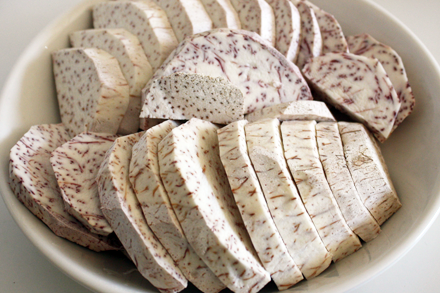 I don’t believe I’ve ever tasted taro paste before – is it ever used as a filling for dumplings or buns? Is it taken as a snack or appetizer (or dessert)? So curious now! Nathan, I love chicharrones! So glad to see that lard is not out of style. That’s a good resolution to make! =) I myself have eaten pork rinds on 3 separate occasions already since the new year. 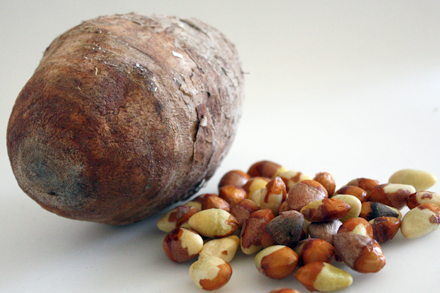 Taro is my favourite root vegetable. I love taro flavoured anything, stuffed in anything, cooked with anything. I miss these traditional desserts so much. I guess I’ll just have to make my own by rendering some lard!